Driving is the default choice for many people. It should come as no surprise: for decades our communities and all kinds of systems have been set up to make it easy to drive. Today, however—with the opening of the Green Line, more bicycle routes, and growing options for car and bicycle sharing—there’s a whole new conversation about how to get where you need to go. Our programs focus on rethinking transportation in the Twin Cities to make these options easier and to address the ways transportation decisions fundamentally impact finances, health, and quality of life. In partnership with social service organizations, our Transportation Options program focuses on rethinking transportation as a basic need, through workshops designed for social service staff and direct transportation assistance for lower-income individuals and families. Transportation—getting to work, school, and other appointments–can be the single largest cost in the family budget. This means transportation can be a serious obstacle for people trying to make ends meet and achieve financial stability. Most programs focused on transportation as a basic need offer loans for cars. Instead, Transportation Options focuses on empowering people in lower-wealth households to save money by using transit, bicycling, walking, bike sharing, and car sharing to get around. There is no program I know of that addresses financial benefits of transportation so directly. Designed for the staff of social service organizations, Transportation Options workshops raise awareness of transportation costs and options. They include experiential learning, preparing staff to better understand and meet the transportation needs of the people they serve. Completing the workshop also is necessary to become a referring organization for transportation assistance. Upcoming workshops are listed on our events calendar. Through formal partnerships with community-based and financial-coaching organizations, including Neighborhood House, Eastside Financial Center, Prepare + Prosper, and YWCA of Saint Paul, we are able to offer one-on-one consulting and assistance to the individuals and families they refer. These participants are motivated to use multimodal transportation options to move toward economic self-sufficiency and to potentially build wealth. Financial assistance makes the purchase of transit passes, car- or bike-sharing memberships, bicycles, trailers, winter boots, or other helpful gear a possibility. • Read more about Transportation Options on our blog. • Download our Transportation Options infographic. Transportation Leadership focuses on the ways that policies, practices, and amenities at work can better welcome multimodal options—transit, bicycling, walking, and sharing. With the expansion of these options in the Twin Cities, it is a great time to focus on these changes. And there are multiple benefits for employers and their employees. Lower costs. Using different ways of getting places can be much cheaper than owning and operating a personal vehicle. Pro tip: car-sharing, such as HOURCAR, can be cheaper than the IRS rate for day trips around the state. Less pollution. Riding a bicycle, walking, or sharing a ride (whether on a bus or via car sharing or car pooling) lowers emissions and improves air quality. Better health. People who use other options avoid the stress of driving and get closer to the Surgeon General’s recommended daily activity. Inclusive workplace culture. With Minnesota’s changing demographics, it’s more important than ever to foster a workplace culture that accommodates multiple travel options and welcomes people of all ages and backgrounds using them. • Read more about Transportation Leadership Certification on our blog. Transportation Leadership best practices are now part of GreenStep Cities. At a time when options for getting around are changing—and interest in using them is growing region-wide—cities can take specific action to foster greener transportation choices among city staff and at city facilities. See the new GreenStep Cities “best practice transportation actions” (PDF). GreenStep Cities are encouraged to “rethink transportation” in the workplace, so that they can better encourage local stakeholders to do the same. Contact us about options for workshops or other trainings. 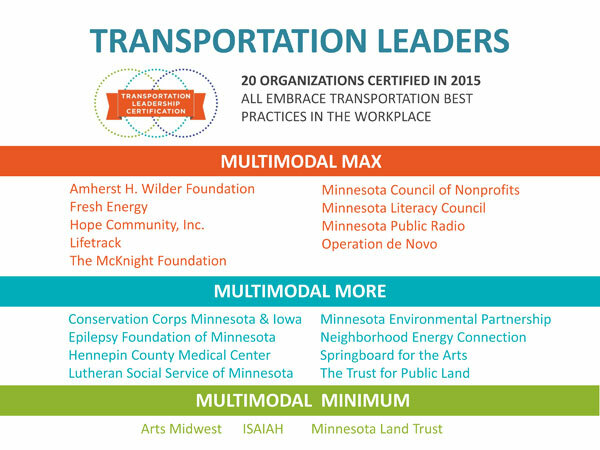 In 2015, 20 organizations were certified as Transportation Leaders for adopting a set of transportation best practices. Varied in size and mission, these organizations are shifting the balance from an almost total reliance on driving to inclusion of other modes. Each organization sent a staff person to a Rethinking Transportation workshop, participated in staff travel behavior surveys, and committed to specific changes. What changes are Transportation Leaders making? All twenty committed to six minimum steps, including providing web site directions for multiple ways of travel, making it a priority to choose locations accessible by transit or other options for off-site events, and incorporating information about options into new hire orientation. Organizations that committed to additional steps, such as compensating employees for using transit, bicycling, or walking; adding showers or changing rooms; and setting up organizational memberships in car or bike sharing, were certified at higher levels. Read more about Rethinking Transportation on our blog. Funding for Transportation Leadership Certification came from the Metropolitan Council Congestion Mitigation and Air Quality program and from the Central Corridor Funders Collaborative. A Minnesota GreenCorps member also worked on this program. We use the Green Line a lot for trips during the day, for meetings in Minneapolis and Saint Paul. It’s very convenient and cuts out the hassle of traffic and parking. Each trip saves $5-10 in parking, mileage. Because a lot of our work is neighborhood-based, staff is near enough that bicycling is a real possibility. Teams working on a project, carpool. We definitely had some folks who tried some stuff out for the first time. One co-worker committed to bicycling in every day. I bet that he wouldn’t do it & I lost!